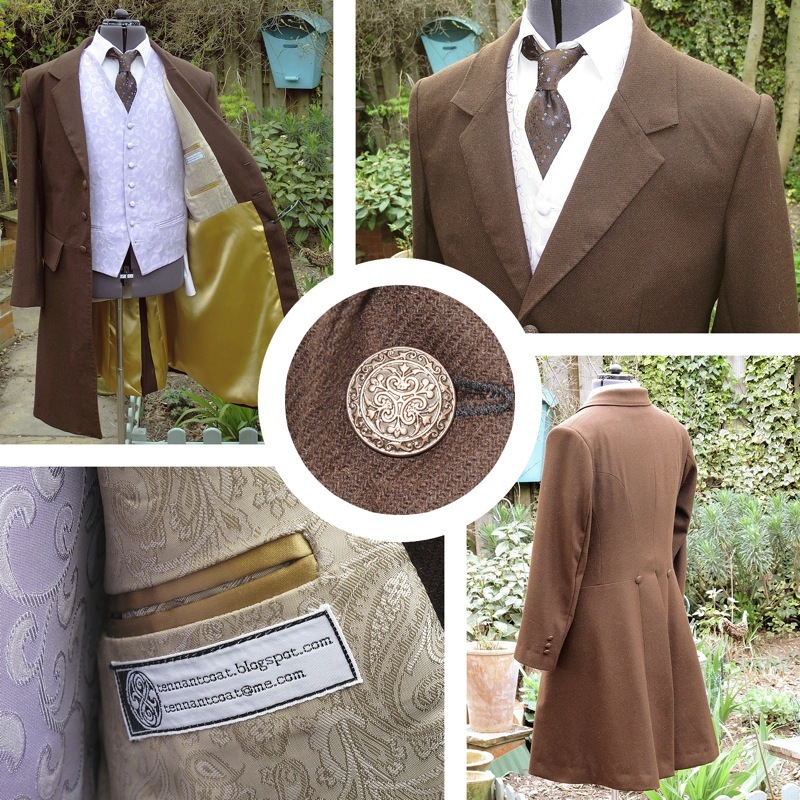 Making up the Frock Coat for Ian was realtively easy, but I did decide to make a little more challenging for myself by radically changing some of my techniques. When I made the Five Coat I used a variety of fusible interfacings to get the right stiffness and drape in certain points of the coat. This is all very well, but it can dramatically change the texture of the fabric and sometimes the fusible becomes detached while you are pressing the garment while making it. Also, if the fusible is not firmly and evenly pressed throughout, it can become detached during wear. I had heard of using calico as a non-fusible interfacing, and I had always wondered how this would work. Well, I got the chance to see first-hand not so long back. 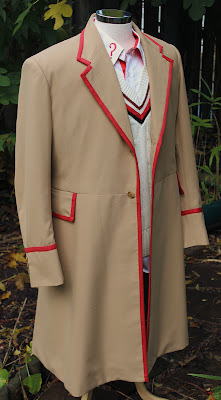 my friends who own a lot of the screen-used Colin Baker costume also own the original Pink Frock Coat worn by Romana in Destiny Of The Daleks, and they brought it along so I could see it, as well as get a full pattern trace from it. A lot of the coat was not as I expected at all. 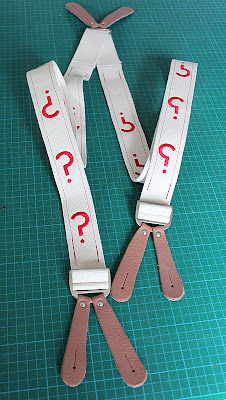 The waistband pockets are just flaps, with no pockets under them; the fabric it is made from is quite a coarsely woven wool, and not at all in keeping with Romana’s delicate character. 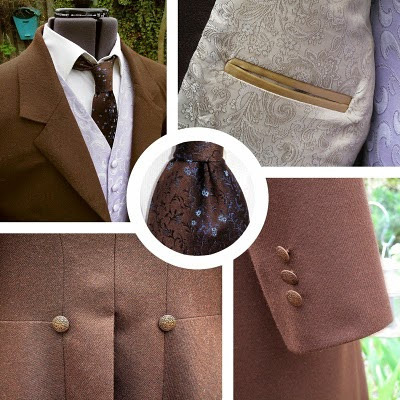 The hem was a surprise as well, in that it was left open with the lining not attached to the body of the coat. This allows for looking inside the coat and some of its internal structure – bonus time for me! Inside I could see the skirt of the coat was faced with calico, sewn in at the vertical seams. It was not bonded to the coat in any other way, but just gave the skirt the support it needed without adversely effecting the fabric itself (ie. fused to it). This got me thinking about how I do my work in future, and Ian’s Frock Coat in particular. So this time round I have been vary sparing one where and how I use fusible interfacing. The only areas I have used it on are the lapels, collar, body fronts, and pocket flaps, which for the moment I am not confident to abandon at this stage. I therefore calico faced the skirt, cuffs and part of the back. All this proved to be a lot easier and surprisingly less time consuming than I thought, and it wasn’t long before the coat was taking shape. The lining was the part I was having the fun with. My brief to make .... something bright, vibrant, even a little clashing, something you would not expect to see inside a brown coat.... was very much on my mind and I wanted to step up to the mark on it. I quite liked the way the green lining works with the brow wool, so I have put this under the pocket flaps and inside the sleeves – basically anywhere you can see lining from the outside when the coat is closed. The inside, however, is something quite different. I loved the silver self-woven paisley I found, but was mindful that it was quite a grey colour and thus a bit too sober for what Ian had in mind. He had mentioned a mustard colour on one of his previous frock coats, and on a visit to Textile King I found a nice gold satin which I knew he would like. But it was how to use the both inside the coat. My eureka moment came when I was cutting the lining and it suddenly dawned on me I could do a form of checkerboard arrangement across the back, with some of the panels in silver, including the panels where the pockets will be set. I have kept it mirrored rather than completely alternate, otherwise it will look too patchwork (see below). I decide to accent the welts for the inside pockets with the gold (see below). Everything went well with assembling the coat, and as it came together I felt I was making something I could be very proud of. Here are some pictures of the finished coat, just prior to it being shipped. Let me know what you think of my latest work. It’s not everyday I get such a free hand on creating a coat to an open brief. By the way, for the eagle-eyed out there, does anyone know the significance of the blue thing attached to my fence? I virtual reality nod of achievement awaits if you know what it is, where it comes from and what other classic genre tv show it appeared in. My good lord. That is beautiful! You should be proud good sir.